I’m a big fan of my HTC HD7 Windows Phone 7, and particularly of the Zune Player application on it. Unfortunately, I am not a fan of the crappy headphone set typically supplied in the box with high-value smart-phones. They’re neither use nor ornament. Previously I have been using some Sony Walkman wired headphones, which had really good reproduction of sound. Unfortunately, and inevitably, the microscopic cabling was going to fail sometime and now I have no right-ear speaker. So a replacement is in order. I have been struggling to find a suitable set of earphones that provide good sound reproduction, with minimal sound leakage to avoid annoying my colleagues and with phone headset controls so I can answer the phone without forgetting than my headphones are masking the microphone. Surely there would be some good quality wired headphones suitable for use with the HTC HD7? Seems not. If you want all the above, it’s all iPhone. This is very frustrating and discriminatory for an open market. Understandably, there are a lot of i* devices out there, but surely there could be some compatibility struck? 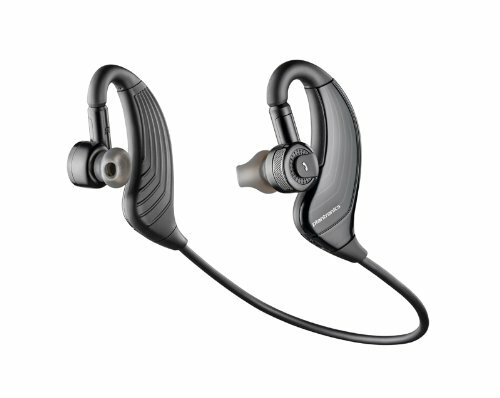 I asked at XDA Developers Forum for suggestions and I was suggested to get a pair of BlueTooth headphones, specifically the Plantronics BackBeat 903+ Stereo Bluetooth Headphones. I was reluctant to try BlueTooth headphones out because my previous experience with BlueTooth (albeit v1 of the specification) was very poor and the last thing I need is yet another battery I need to remember to charge. But they came highly recommended so I gave them a try. They paired really well with the HTC HD7, the Metro UX makes it an absolute snap. Getting the headphones on and off your head can be a little tricky as they need to fit around/through your ears for a good and secure fit. You’ll get the hang of it, over time. If you wear them for longer periods of time, however, they do start to make your ears ache. This isn’t an audio ache, more of a physical ache associated with having to bend your ears around the headphones. Maybe I’ll get used to them in time. Interestingly, they also repeat ambient noise so you still hear around you, and having just heard the phone ring while listening to music, seemingly during playback. It’s not a distraction as such, I guess it reduces the opportunity of you ignoring your colleagues. But what about the music quality? These were listened to on volume level 16 of 30. Not sure how high the headphones were, but I prefer high amplification in the source, low amplification in the speakers. So while they are acceptable for most music, I do find that there are more variables in play when it comes to streaming the music than if I used wired headphones. But where was the deficiency creeping in? Was it BlueTooth bandwidth? A deficiency with the original source? Or maybe the headphone speakers were poor quality? BlueTooth transmitter (v2.0 practical is 2.1Mbps, theoretical 3.0Mbps) and compression for over-the-air. It seems that a stereo 192Kbps audio stream is on the very edge of practicalityfor BlueTooth. Plenty of opportunity for problems to creep in. It seems that the overlaying of the 192Kbps source, with the BlueTooth bandwidth creates a combined effect as a result of the headphones being unable to compensate for errors in transmission from the original, already lossy source. That said, putting other sources such as Björk through them did work quite well. Björk is always a good test for audio quality, though it can often be difficult to pick out deliberate distortion and incidental distortion in her work. So I think it might come down to application. I’ll probably use these headphones for walking to work, where background noise is sufficient for me to not be bothered by very minor deficiencies in the audio and a wired set at my desk for total immersion (Have a set of Sennheiser MM70’s on my desk waiting to be tried). If you’re not as unnecessarily fussy as me, buy them, they’re a great set for most music. Just keep in mind that extra battery to keep charged! Update: Having now listened using the Sennheiser earphones (the control test), the quality is much better on the wired set. proving my assertion that BlueTooth adds unnecessary processing stages to the detriment of audio quality. The wired headphones work well with the HTC HD7, I can play/pause music and answer/end calls using the control button on the headphone lead as you would expect. The volume buttons and track advance controls don’t work, however, which is to be expected on i* headphones, I guess. Once again, I’m not an audiophile, nor am I anything more than an amateur physicist. If you can clarify or improve my modest findings, it would be appreciated.